According to reports from the popular committee, about 25 soldiers with painted faces entered the village, and threw sound bombs at international activists who have remained in the village to witness the night raids. 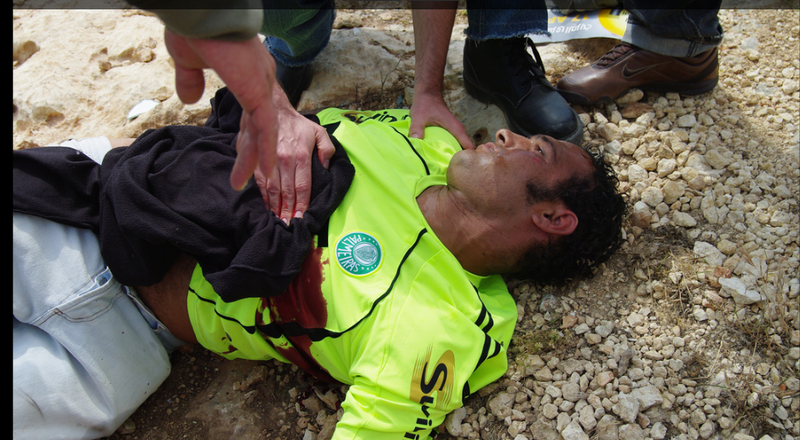 Internationals attempted to intervene and demand Abu Rahmeh’s release, but were physically assaulted as they approached. Reports said soldiers knocked one woman to the ground and pulled the hair of another. Attendees of Bil’in’s fourth annual conference on nonviolent resistance walked with village residents to the site where Israeli soldiers shot and killed 29-year-old Basem Rahmeh one week ago and erected a monument in his honor amid torrents of Israeli bullets and tear gas. Four Palestinians sustained bruises after being attacked by Israeli soldiers during the weekly anti-wall protest in Al-Ma’sara south of Bethlehem Friday. Tens of locals and international peace activists rallied against the construction of the illegal Israeli separation wall and settlement expansion. Ralliers also marked the death one week ago of Basem Rahmeh, killed by an Israeli tear-gas canister shot at his chest in Bil’in. Villagers, backed by ralliers, requested permission to enter their lands on the far side of the Israeli separation wall, but were denied. 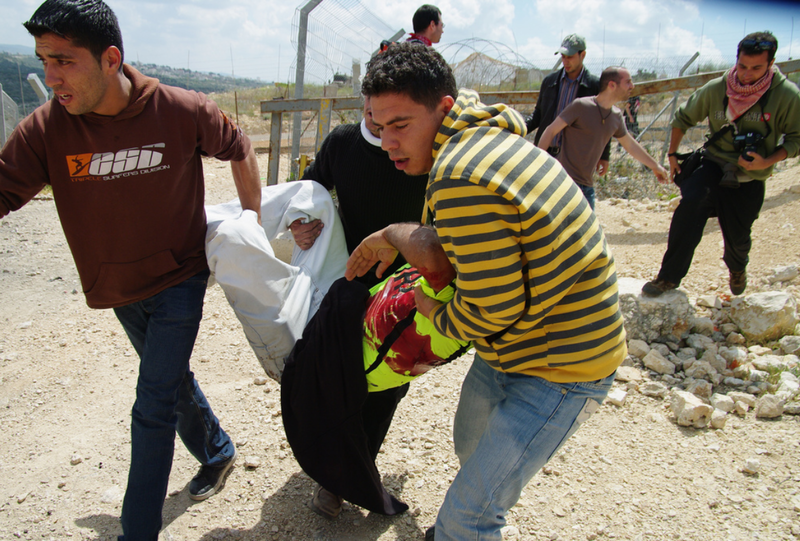 The ensuing protest lead to several youth being beaten by Israeli soldiers. Dozens choked on tear gas and four others were injured by rubber coated bullets when clashes erupted between Palestinian youth and Israeli soldiers in the village of Ni’lin during the weekly anti-wall protest Friday. Residents at this week’s rally commemorated the death of Basem Ibrahim Abu Rahmeh, killed by a high-velocity tear-gas canister shot at his chest in Bil’in village’s anti-wall protest last week. 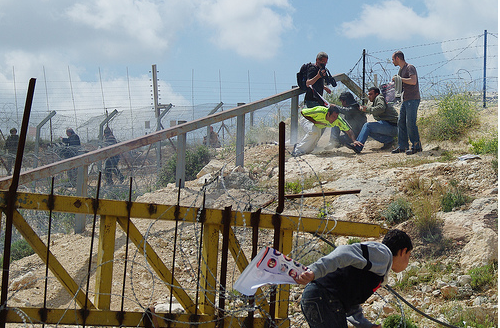 They were matched by a dozen Israeli settlers marching on the opposite side of the wall. Bil’in’s fourth annual conference on nonviolent resistance will see at least two presentations by Vice President of the European Parliament and outspoken supporter of Palestine Luisa Morgantini, who will stay in Palestine for a week. The “priority objective” for Morgantini’s visit will be addressing the conference, though her itinerary also includes a meeting with Palestinian caretaker Prime Minister Salam Fayyad and several meetings with the Beit Jala International Women’s Committee. Morgantini will also take part in the weekly nonviolent demonstration against the construction of the Israeli separation wall in Bil’in Friday. This escalation was not caused by the demonstrators’ behavior, in which there had been no change, but to new instructions given to the military forces on the ground. Whether by explicit instructions or by a tacit nod and a new “spirit of the commander”, the finger on the trigger was loosed and authorization given for the tear gas containers as lethal missiles. 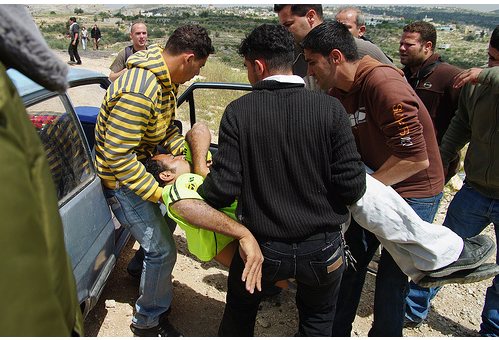 This is the second time soldiers have fired on unarmed demonstrations from a lethal range in the past two months. On 13 March 2009, American activist Tristan Anderson was shot in the head by the same type of ammunition, putting him in a coma and nearly killing him. The demonstration on Friday afternoon was meant to commemorate Land Day, but Israeli soldiers attacked the protesters, injuring four of them, including Americans and others who choked on teargas or were shot. It was not immediately clear whether or not the injured demonstrators were shot by live fire or rubber-coated bullets, although it is usually the latter at the weekly anti-wall demonstrations across the West Bank. Protesters’ banners condemned Israel’s ongoing policies and violence against civilians, especially in Jerusalem and commemorated what the Palestinians call the Land Day. The protest began in the center of the village then headed towards the Apartheid Wall which is being built on Bil’in’s land.